Raising a Super Dog - moved to rasuperdog.com: Would you rather . . . ? Would you rather . . . ? In a past life I spent a few years as a catechist at my church teaching a faith formation course to seventh graders. "What?" you're thinking, "Seventh graders! A few years? Are you nuts? Why would you do that?" I can actually answer that in one word: penance. Ah, kidding, kidding. No, actually I'm just an idiot and had no idea what I had signed up for. Although, once I got into the groove of things, it was a great time and I have wonderful memories to take with me to old age. So, you want to know the secret of how to teach morality lessons to 12 year olds without all the eye-rolling and sighing? News flash . . . you can't. Disdain just comes with the territory. But I did have a super special secret weapon that got their attention every time. The book of Would You Rather . . .? This little tome peddles itself as "four hundred and sixty-five provocative questions to get teenagers talking." Would you rather . . . wear dirty underwear or dirty socks? Would you rather . . . eat a hamburger in front of a starving child or destroy a child's self image? Would you rather . . . watch Barney or Sesame Street? There's something about Barney that just put seventh grade young people on the defensive. If a child psychologist hasn't written a paper on that subject, well they should. All interesting stuff, you say. But why am I sharing this with you? Because I received something in the mail that raised a would you rather question for me. Totally wonderful news, but caused a morality check. 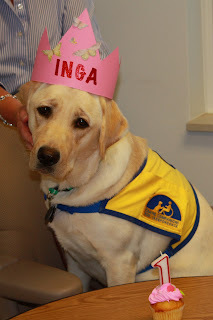 I'm told that my first CCI puppy, Inga, has been selected for team training in May. I'm so jazzed about this, that it's crowding out any other thoughts. We are so close to seeing her be matched with someone. Cautious optimism; we're close, but not there yet. If a match isn't made during this team training, she'll wait until the next team comes through. But still, she made it this far! I'm doing a happy dance. Just in my mind, though. Otherwise, I'll just hurt myself. Now that this is all in-my-face real stuff, no more imagining what to do if she doesn't make it. This beautiful dog I raised for 14 months, who was my constant companion during that time. This dog I loved and worked so hard with. Would I rather she graduate from CCI and become a service dog or do I want her back in my life? I've said all along that I wanted to raise a service dog and I meant it. Now I know that Inga is not ever coming back to my home. How do I feel about that? Ah, reality smacks me in the face yet again. I do love that dog. I loved the time we had together. And I love that I was able to be part of something that could possibly change someone's life in a profound way. Hey, you know what? I'm ready to share that love. My dog, who is not my dog, is moving on. This is bigger than just me. That's my morality check and I'm feeling pretty damn good about it. Puppy raising for CCI rocks! Puppy raising does rock! Congrats on Ingra making it to team training. Always amazing to watch the puppy that you poured your heart and soul into go on to make such a profound difference in someone's life. Congratulations on the important milestone. There is truly nothing like puppy raising! !